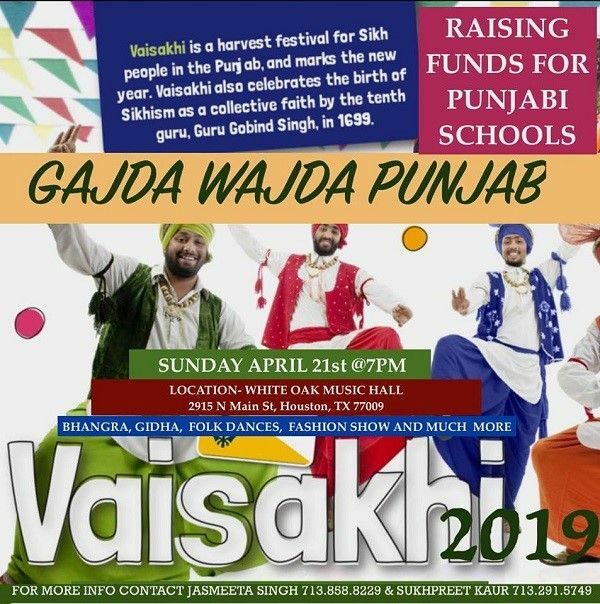 Please note Vaisakhi 2019 - Gajda Wajda Punjab occurred in past. 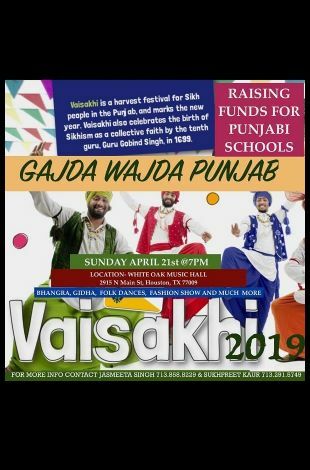 VAISAKHI - THE CELEBRATION OF HARVEST SEASON AND SIKH NEW YEAR!! The harvest festival of Punjab, INDIA, is celebrated on the first day of Vaisakh of Punjab calendar, April 13th or 14th on the Gregorian calendar. It not only marks the Sikh New Year but also honors Sikh faith and traditions. All festivals - Holi, Diwali, Iid, Christmas are celebrated with festivities; cultural food & dance brings all of them together to celebrate! We have the honor to invite all ethnicities of diverse cultures to celebrate rich Sikh culture! All funds from this celebration will be donated to Punjabi Schools of Houston. THE DAY AIMS TO DEMYSTIFY THE TURBAN and celebrate Sikh New Year. This also is a TURBAN DAY! Food, Entertainment, Face painting and Shopping . COME ON WITH YOUR FAMILY AND FRIENDS TO ENJOY THE BEST TIME IN PUNJABI STYLE.